Skyrim VR review: Better in virtual reality? Despite the dated graphics, Skyrim VR somehow still manages to be a magnificent RPG romp with all the freedom, fun and frolics we remember. The new mechanics are well-done and intuitive too, they also add to the immersion and add new excitement to a seven-year-old game. The Elder Scrolls V: Skyrim was originally released way back in the hazy days of 2011. Since then it's seen a few different iterations including a re-released enhanced edition, a portable version designed for the Nintendo Switch and now an outing into virtual reality. 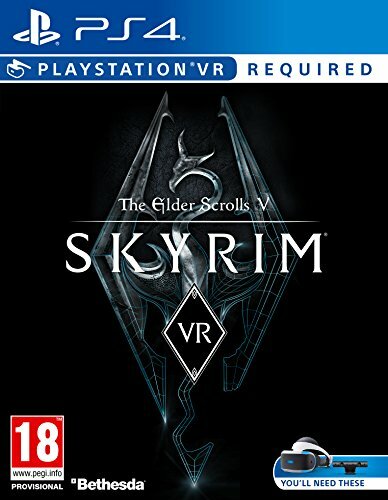 When we heard that after an initial outing on PlayStation VR, Skyrim VR was making its way to Steam VR and could be played on HTC Vive, Oculus Rift and Windows Mixed Reality headsets, we were excited to see how it played out. So is this just another VR port or a worthwhile outing that has something truly interesting to add? We strapped on the HTC Vive Pro to find out. Diving into the virtual world, it's quickly clear that this is the same Skyrim that many know and love. This, unfortunately, means some pretty dated looking graphics and rather clumsy characters lumbering about before your eyes. The last time we played Skyrim it was heavily modded with a mass of different graphics and gameplay enhancements. Going back to the original game but in VR has its ups and downs. At its base, this is a seven-year-old game, which shows. The games world moves fast. But despite the failings of ageing graphics, the port into VR works rather well. Why? Because Skyrim always was a great game. The VR version has exactly the same story as the original, meaning you start out in the back of a rickety cart being pulled along for your imminent death at the chopping block - only to be saved by a fearsome dragon reigning down fire from above. Rogue soldiers try to stop you and giant spiders seem intent on ending your existence before the game has barely started. But it's immediately obvious that this is Skyrim VR's highlight: the sheer joy of having it out with various creatures from the Elder Scrolls universe, only larger-than-life and right before your eyes. The controls are well designed and intuitive for a virtual reality game. There are plenty of customisable settings, too, which allow you to modify the gameplay to your liking. We found options for "physical sneaking", "realistic bow aiming", "realistic shield grip" and "realistic swimming", each of which add a pretty cool control method to the game and helps increase the level of immersion. When you can raise your shield to block rather than pressing a button on your keyboard, or pull a drawstring to fire your bow at an oncoming dragon, or duck down in the real-world to sneakily pick someone's pocket, it makes for a truly awesome experience. Realistic swimming is pretty hilarious too - ducking your head below the water and waving your arms about until you start to move. There are a number of different mechanics for movement that include teleportation and locomotion. You can also choose whether those movements are smooth or instantaneous – so you can adjust to suit your gameplay style (and what you can handle in terms of nausea-inducing movement). Forward movement, especially sprinting, is handled with a black cone around the edges of peripheral vision that acts in a tunnel-like manner when you move quickly. This alleviates some of the problems you might encounter with this otherwise. Our favourite of all, though, is galloping around on a VR horse while bursting spells from the palm of your hands. Spellcasting and shouting is so much more fun and immersive. Does it make sense in VR? Despite all this, however, we're not sure VR is meant for role-playing games. Especially ones on the scale of Skyrim. Last time we played we spent well over 60 hours roaming around in the Skyrim universe. Doing the same in VR would be incredibly exhausting. Especially if you're like us and you enjoy to play at room-scale standing up the whole time. Doing this means you can do things like realistic sneaking, but it also means a nagging backache when you've climbed the 7,000 steps to see the greybeards or trekked through the snow-drenched plains to reach your next objective. That said, we soon found how easy it is to get lost in this game while the hours slip away. Especially true when you're in the VR world and can't see the time ticking by in the real one. The only indication that you've been playing too long will be the ache in your back and the dull throb in your feet from standing for hours. Unless you play sitting down, then your eyes will be the first to go... unless you take an arrow to the knee. Playing seated is perhaps the more logical choice if you want to get stuck into the game, but that would take away from the battle mechanics and the fun of the realistic controls. The problem with a game like Skyrim is it brings out our kleptomania. We feel the need to loot everything in sight. Which means we get in trouble with the local village folk when we steal their goods or "accidentally" kill their chickens. Luckily, just like in the original game, quick save is available, which is a saving grace. We soon found ourselves looting bodies and picking flowers with reckless abandon. Oh, how we long for the loot cheat to alleviate any misery with inventory space issues. "You are overburdened and can no longer sprint". Hello misery, our old friend. Looting aside, we'd forgotten just how much fun this game can be - and how frustrating too. We won't go into the depths of the story, but needless to say you'll want to be a role-playing game fan. Whether you're into demons, dragons and the like, however, doesn't necessarily affect whether you'll like the game - there are umpteen elements that will keep you hooked, whatever your fantasy level preferences. It goes to show: a good game is a good game. Despite the dated graphics from a mere seven years ago, Skyrim VR is still the magnificent RPG romp it always has been. There's all the freedom, fun and frolics we remembered on the first outing, just in virtual reality form, which brings a freshness to the game. There are plenty of other highlights to playing Skyrim in VR too. Browsing the skills and spells menus opens up that universe-like browser that enshrouds you, which is beautiful to behold. The map, too, gives you a god-like view of the world and really adds to the feeling of wonder. The lock picking mechanic is there too, but reimagined for VR. Building, crafting, the massive and unrelenting skill tree, dragon slaying galore - all the wonder of Skyrim is here. We found very little in the way of bugs in our playtime. Sometimes inventory menus did disappear into world objects, making them impossible to see, but that was rectified by opening and closing the menu. If you thought that Skyrim had already seen too many outings, think again. Skyrim in VR is a great way to relive the wonder of the original in virtual reality. Or maybe you never played it, in which case this is a great entry point. If the idea of playing an old game with dated graphics doesn't completely appeal, however, then the good news is Redditors have discovered a number of mods that work with the game and an easy way to install them too. Meaning that if you're willing to invest the time, you can apply a number of mods to make it look better, have more content, or just change the way the characters talk to you. Overall, Skyrim VR's great story, epic scale, and freedom to roam make it every bit as good as the original. The realistic VR mechanics make it surprisingly immersive and easy to play too. The only hard part will be standing on your feet for umpteen hours. And believe us when we say that you will - which goes to show just how addictive this classic game remains. Skyrim VR works on HTC Vive, Vive Pro, Oculus Rift, Windows Mixed Reality headsets and Playstation VR. It's available to buy now on Steam.